First up is my Giant Star Surround is just about finished and will be completed today! Woot Woot! 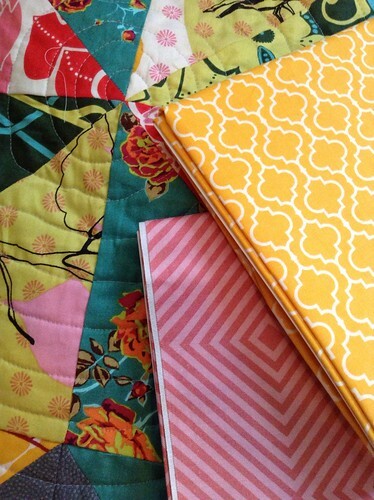 I finished up the quilting last night and picked out the binding. I was having a hard time deciding if I wanted to go soft with the pink and bring out some of the femininity in the quilt or go with the bright yellow that is so bold. Guess you'll have to wait and see what I decide! How's that for a cliffhanger? Speaking of cliffhangers, I finished all three seasons of Pretty Little Liars on Netflix and boy did season 3 leave me hanging! I even had dreams about it last night. I might need to do some research to find out how I can watch season 4 because I don't know if I can wait for it to come out on Netflix. I might have to call this my Pretty Little Star Surround quilt because it was completely constructed during my summer obsession. On to more exciting news, look who's all pretty and basted? I am almost sure I will have to quilt her on my dining table with my new quilt clips. Just not sure how I am going to quilt the big beast! If you can't tell, this is my Swoon 2013 quilt. Oh, and this is my 100th blog post!! That's a lot of sewing, quilting and typing, oh my. Thanks for reading and keeping me going! Linking up over at Freshly Piece! Both quilts look lovely. Love all your fabric choices. Wow, so much to celebrate! Can't wait to see how you quilted your giant star. I have been looking at mine trying to figure out how I want to quilt it. I need to get that done soon!! Sometimes it takes forever to comment to a quilt design. I actually quilted mine in one giant swirl starting in the middle about 2in apart. It was fun and quick. Hope the inspiration hits you soon! Thanks for coming by! Swoon quilts are always so beautiful! They seem like such a lot of work, though! (I'm sure it's not so bad if you break it up, but still.) Can't wait to see what you do with it! They really are! 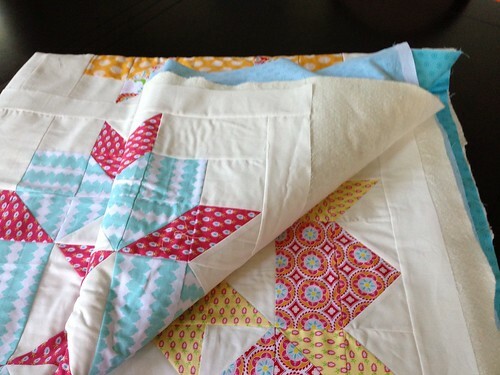 I don't think you can go wrong with a swoon quilt. They are lots of work, too but your right, breaking it up helps. Otherwise it becomes pretty cumbersome. I like how the star surround operates with one task a week. Thanks for visiting and leaving a comment!! You sure know how to keep us hanging with those two luscious binding choices, Melissa. I am voting for the yellow! But, then again, I do love a stripy binding, too! Looking forward to seeing your finished swoon also. 100 posts! Congratulations! I just met that mark myself this past week! Woooo!!! Happy 100th post!!!! That's very exciting! As for your quilts...I think I'm in love with the first one. I really really really like the spiral quilting on it. I can't wait to see the finished product! I'm glad I'm not the only one who devours whole TV seasons/series while working on crafts. I'm a bit sad I'm almost out of Merlin episodes to watch. Hope you find season 4 of PLL soon!